It’s been a while since my last blog. The good thing is we’ve had lots of others contribute, which I’ve been very pleased with. Expect to here from others as well. I want you all to really get to know our entire team. These guys, players and staff alike, have goals and aspirations just like everyone else. Some people are stuck in a rut. My hope is that reading about how people within the Flight organization are adding an action step to compliment their faith will inspire others to do the same. So…the 2011 season is upon us! Time certainly does fly. I’m pretty excited about this year, especially considering we’ve had much more time to plan and strategize. We have a new community, Avalon Park, to call home. 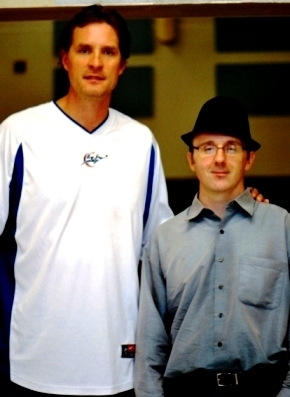 We continue to establish partnerships with key people, like Christian Laettner and the Streetball Live team. More than that, the businesses within the Avalon Park community have shown an incredible amount of support for us. We’ve noticed a demand for a Junior Flight team program, which we hope to implement in May or June. We have Ernest Jones, Garvin Gordon, Jacob Carver and Jay Husagic returning from last years team. We added a big time recruit and former teammate of mine from the East Kentucky Miners of the CBA, Mike Dean. We’ve even found a few promising rookies to add into the mix this season, many of whom call Central Florida their home. We’ve brought back The King’s Offspring (our musical hosts), Josh Aries (our team photographer), Rebekah Day (Game Day Operations), John Weis (Media Relations), and Pastor David Keyes (Team Chaplain). Of course, you’ve already heard a bit from our newly appointed General Manager, Rabon Smith. All in all, we have built a solid core to provide Avalon Park and the entire East Orlando area with a professional, high-quality, affordable, family-friendly basketball entertainment option. I do have a couple of additional updates. The first involves the head coaching position. As much as I long to play, I will again take the role of Head Coach for the Flight. One of our key slogans for our team is “Sometimes…You’ve gotta create your own shot!” When the Flight initially took shape, it was a big priority of mine to create an opportunity for myself and others to share the God-given basketball talent we have been blessed with. However, knowing full well what is required to create a sustainable franchise, I cannot put myself over the mission, vision, and well-being of our program. There is still work to be done. There are fans to reach, corporate relationships to develop and nurture, and a needy community to invest in. If/When our franchise reaches a place where things are operating more fluently, I might throw on the #14 again and get back in between those four lines on the hardwood. Until then, I’m going to continue to do the things that I can do best. One of those things involves using my knowledge, communication skills, and motivational energy to develop our players and prepare them for bigger and better things. It’s a sacrifice, but one that I believe, wholeheartedly, God has called me to right now. I’ll end by simply requesting your support as we embark on season two. Our mission statement – “utilize the platform of professional basketball to invest in the lives of others” – is genuine, and our motives are sincere. I can say with full confidence that people who attend our games walk away pleasantly surprised at what we provide for just $10.00. Be encouraged to share this experience with others. Help us grow our franchise into what God has in store for us. We operate in a business where attendance numbers and financial capital are key resources that greatly effect the impact and influence that we can have on our fan base. We will always seek to win basketball championships on the court, but the real championship is off the court. The Flight is about inspiration. It’s about motivating others to fly higher than status quo…towards achieving the things God has intricately designed each of us to do. Fly higher with us, as we commit ourselves toward striving for excellence in all that we do!